When the Manchu invaded China and founded the Qing dynasty, they introduced their archery culture into China. Manchu archery equipment got widely adopted also by Chinese soldiers, and the Manchu style bow became the standard Chinese bow. For the Manchus, archery remained a defining part of their cultural identity and they were the last major empire to use archers to good effect in the field, defeating armies largely relying on firearms with a mix of Manchu archery and Chinese musketeers as late as the 18th century. Chinese military examinations with heavy bow pulling and target archery tests were only abolished in 1908. 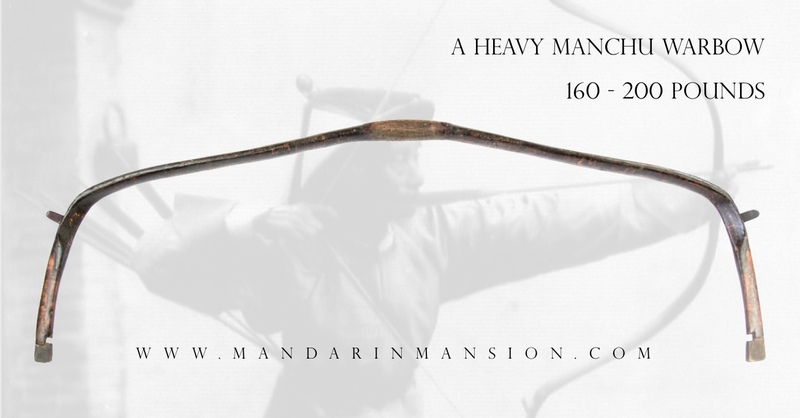 "A 1736 report found that of 3,200 troops at the Hangzhou garrison about 2,200 were able to draw bows of strengths six to ten [80-133], and 80 could handle bow strengths of eleven to thirteen [147-173 pounds]… …In comparison, the 500 troops at the small Dezhou garrison acquitted themselves with honor, all of them being able to take a five-strength bow [67 pounds], 203 a six-strength [80 pounds], 137 a seven ­strength [93 pounds], and 85 a ten-strength bow [133 pounds]." -Mark C. Elliott, The Manchu Way , Stanford University Press, 2001, pages 179 & 180. “The Chinese bows are large and powerful... Bows of 150 pounds are by no means rare in China. The arrows used at the siege of the Legations in 1900 are 3 feet 5.5 inches long and 7/16 inch in diameter with heavy socketed steel heads. Some of the whistling arrows are 4 feet 2 inches long with heads four inches in diameter and six inches long. The bows that I saw in Peking that were used with such arrows were huge, about six feet long strung, with a cross section at the handle of nearly two square inches. They were said to pave a pull of about 200 pounds and looked it." Historical draw weights of Qing bows. Most antique Manchu bows on the market are of a target shooting type used for sports or for the target section of military examinations. 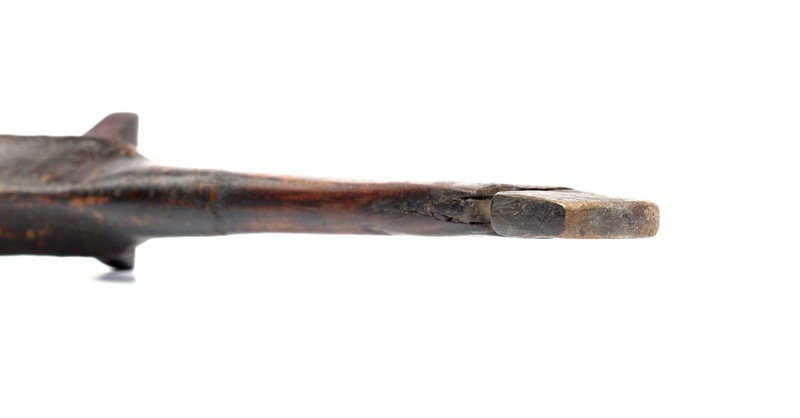 Bows of military draw weights are much rarer on the market, probably because they were often not very decorative. Extremely heavy ones like this one are exceedingly rare. 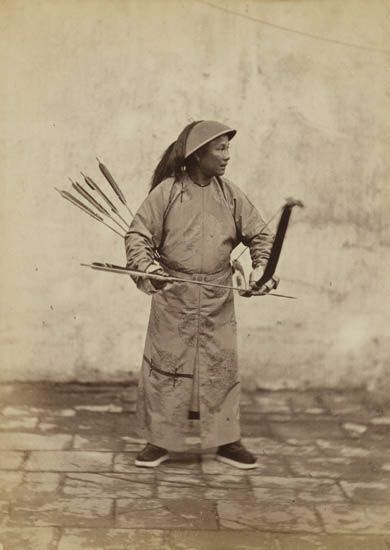 A Manchu archer about to nock another arrow. The width of the limbs of his bow indicate it's probably a fairly heavy one. From the album of an American diplomat. 1880 to early 1890's. Materials: Buffalo horn, wood, sinew, birch bark, cork, pigments, lacquer. Presented is an exceptionally large Manchu bow. 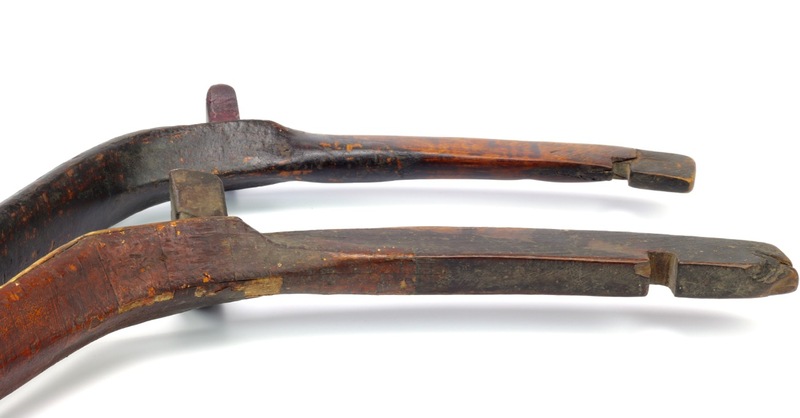 Of classic construction with buffalo horn horn bellies to take the compression of the pull, and sinew backings to take the stretching on that side of the working limbs. The long, rigid ears in typical Manchu style with wooden string bridges and inserts in the nock: Horn on one side, wood on the other. One of the two nocks is probably a later, working life replacement of a broken piece. Same for the string bridges, made of two slightly different types of wood indicating that one was replaced at some point. Judging from the size of its massive working limbs, it would probably take between 160 - 200 pounds to pull this bow. In the official Qing measurement, what would make it a bow of 12 to 15 li (strength). 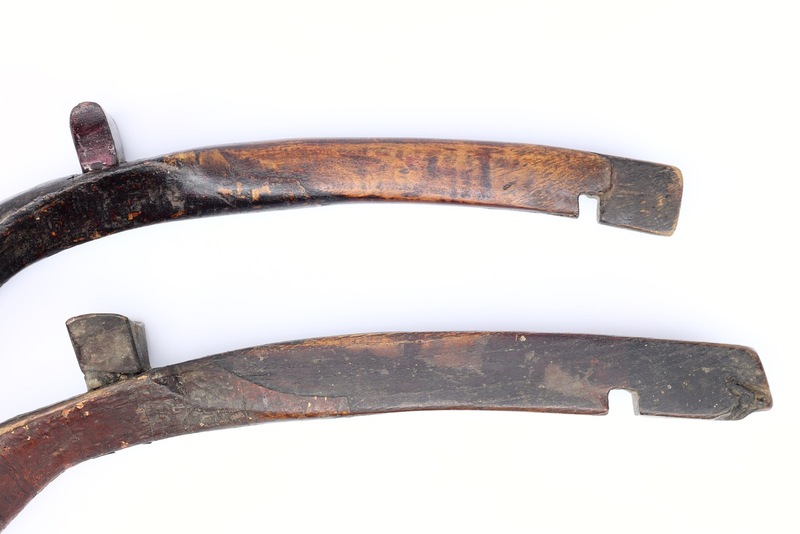 Bows of such draw-weight were primarily used for strength training and demonstrations of strength of the Qing examinations. However, the pure strength training bows were often overbuilt with bulky ears, large string notches for a thick gut string, and often thick all-wooden ears without splicing at the nocks. This made them more durable, even when the archer didn't draw them correctly like when applying too much torque to the handle. In contrast, on a bow made for shooting the bowyer wants to reduce the weight of each part so the bow becomes snappier, shooting an arrow faster. The bow presented here is interesting because it belongs to the heaviest bows found among Manchu bows, while the construction of the ears suggests it wasn't merely designed for pulling tests. Its ears slender enough to shoot efficiently. It has nocks spliced into the tips to add strength to the greatly reduced thickness of the ears. A comparison of ears. An ear of this bow compared with the overbuilt ear on a pure strength bow in my collection. Notice how much weight is reduced on the ear of this bow, compared to the strength bow. Limb comparison, it is actually the limb of this bow that is thicker than that of the strength testing bow from my collection. 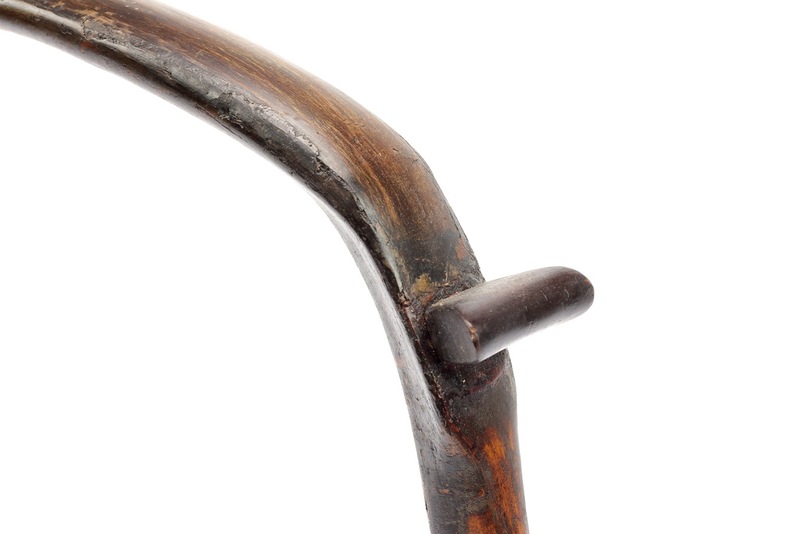 Strength bows with such spliced tips are known, for example a complete set of these bows in all weights that was obtained my Berthold Laufer for the Chicago Field Museum. These however are deluxe editions with elaborate decoration all-over. The bow presented here is otherwise very humble, and one cannot escape the impression that every aspect of its design was purely practical. 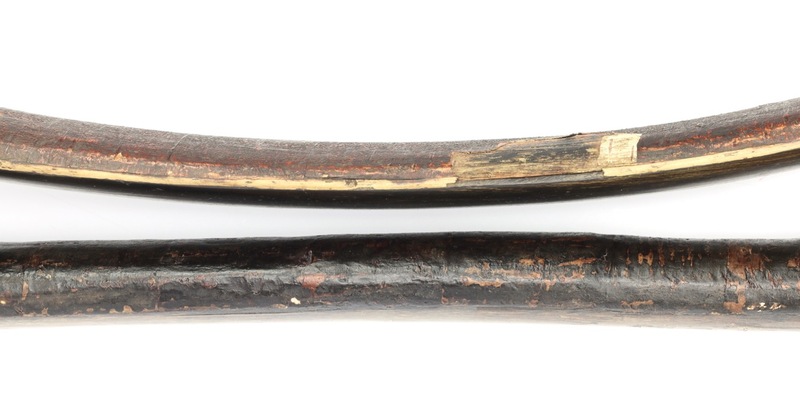 Condition is often a problem when it comes to composite bows, but this bow is in excellent state of preservation, retaining almost all of its original birch bark covering. It has none of the usual problems like insect damage or delamination of the limbs. The usual wear and tear and scuffing on the surfaces, but structurally sound. 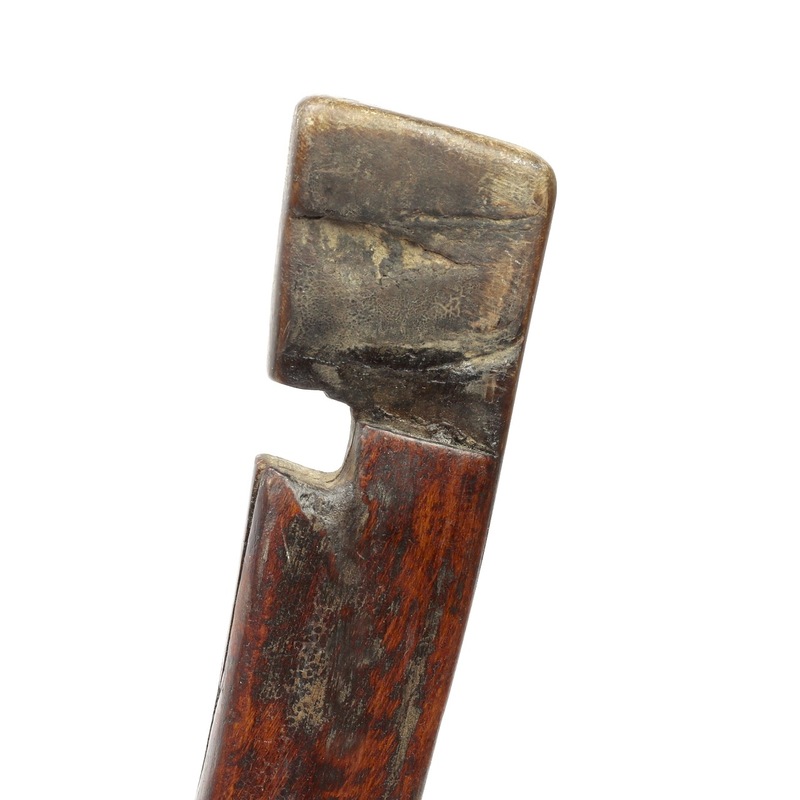 An antique Manchu bow of one of the heaviest types encountered among antiques today. Judging from its design it may well have been not merely a strength training bow but a bow that was actually shot. Even though archery skills declined over the course of the dynasty, they were still in use at the siege of the legations in 1900, where massive war arrows and whistle arrows were shot into the compound by Qing soldiers.